Two years ago, John and I spent our first anniversary in Charleston, and since we were planning to be in Charlotte for Blake and Ginna's wedding, we decided it would be fun to extend the vacation with a third anniversary rendezvous in Charleston. Our official anniversary isn't for a few more weeks, but we decided it was too great an opportunity to pass up! ONE | When John and I first got into Charleston, we headed to Folly Beach for some relaxing beach and sun. We were both pretty tired from the wedding the night before, so it was a perfect way to enjoy being in South Carolina without too expending much energy. 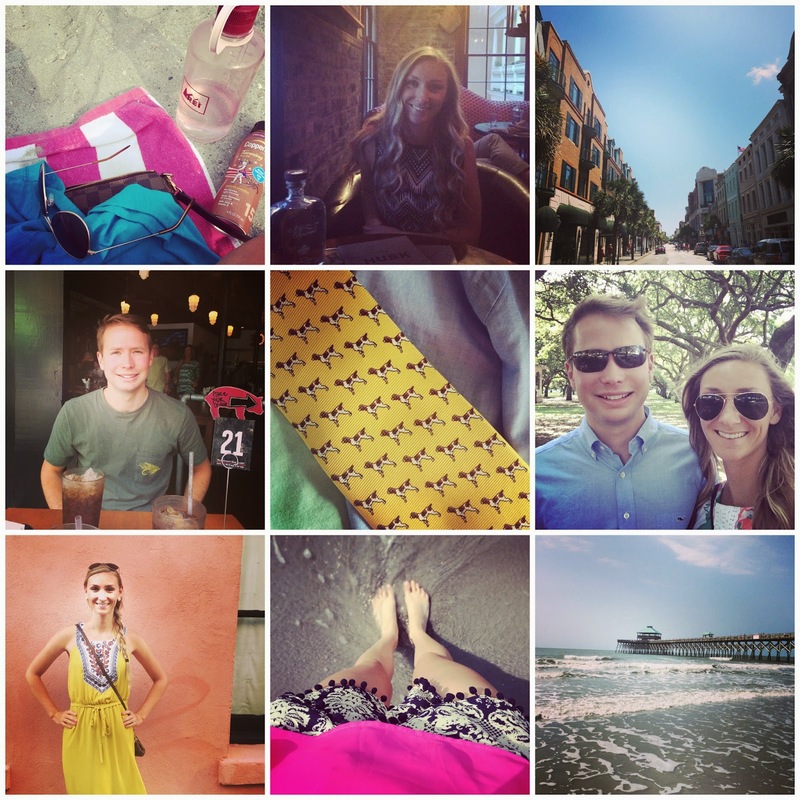 TWO | After the beach we went back to the hotel and headed into downtown Charleston for dinner at Husk. It was amazing! We had to cancel our original reservations, so we went to the bar area for drinks and food. We highly recommend eating here if you can... the building and decor is rustic and absolutely amazing! THREE | We woke up early the next day for some serious shopping. We probably shopped a bit too much, but Charleston just has shop after shop (after shop) of amazing boutique shopping. It's hard to stop until you have been to all of them! FOUR | We had a lunch break at a barbecue joint per John's request. If you know my husband at all, then you are not surprised by this. The man loves his barbecue (I've mentioned this before, but before he had a "real person" resume, he had barbecue listed as an interest on his resume...). FIVE | One of my favorite buys of the day was a Southern Proper Brittany tie for my husband. Our sweet puppy, Scout, is a Brittany, and we just had to represent her while in Charleston! SIX | We, of course, did the obligatory walk through the battery and swooned over all of the amazing homes. I mean really, these house are absolutely incredible, grand, and gorgeous. I don't think looking at them would ever grow old! SEVEN | John was craving seafood so we made reservations at Amen Street Seafood. On our way there we stopped and took a few photos in front of some of the Rainbow Row houses. When we were there for our first anniversary, we had photos taken in front of some of the homes (my button picture, for example) so it was fun to recreate some of the photos. EIGHT | The next morning we headed back to Folly Beach. It was much less crowded, and we really enjoyed ourselves walking up and down the beach looking at sea shells and enjoying the beautiful morning weather. We had a fabulous trip, and despite a few difficulties getting home, the trip was pretty much perfect. Every time we go to Charleston we leave feeling like we a had a ton more to see... which makes me look forward to the next time we go! So jealous! Charleston is on my list of must visit places with the hubby. Now if only we had the free time to be able to go away and see some of these places! Looks like you had a blast though!! I'd love to visit Charleston! I love cities with plenty of southern charm. haha bbq on the resume - love it! What a fun tie too. I've always wanted to go to Charleston! I will definitely have to check it out. Looks like you all had a blast, love all the pics! Charleston is absolutely on my list. One day! And yes, I want details on that yellow dress too please! How fun! I've never been to Charleston. I would love to go someday! You look great in that yellow dress! I fell in love with Charleston in March - there is so much to do and see and EAT!! Love your yellow dress - so pretty on you!! It looks amazing. I want to visit Charleston! I love Charleston! It's such a pretty place to be, and we went there a lot when I was super little. I need to go back and take the hubby! I've always wanted to go to Charleston!! Looks like a blast!!! :) happy early anniversary!! How fun!!! Looks like a great trip! Those pom pom shorts are too cute!! Sounds awesome! I can't wait to go to Charleston one day, it looks so beautiful! BBQ really is the best! I can totally get behind your husband having it on his resume ;) One of my favorite things to do when I've been to Charleston is to look at all of the gorgeous houses! It looks like such a great trip! Sweet tie! Looks like a great trip! What a great anniversary celebration, definitely looks like a place I need to visit! Charleston is my absolute favorite! Hubs and I are going to Charleston in August for a long weekend! We are eating dinner at Husk one night so I am so excited to hear it's great! I love Charleston! The houses are just gorgeous! Happy anniversary! Sounds like a great way to celebrate your anniversary :) I've never been to Charleston, but it sounds like somewhere I'd like to visit. Love love love this! We're heading to Charleston for the first time in July for our first anniversary so I'm making lots of notes :) This just made me so excited! I realllly hope to visit Charleston sometime this summer or fall! !